Its a high quality, thin layer waterproof slurry coating. Based on special cements and admixtures to provide a water and damp proof finish. When mixed with water a slurry or mortar material is produced for direct application to a variety of construction substrates. 1mm min. 2mm max in 1 coat. Dependent on the substrate roughness, surface profile and thickness of the layer applied. As a guide, 2.1 kg/m2/mm (excluding allowances for loss wastage, surface profile and porosity, etc.). 1 unit of 25 kg yields will cover approximately 6.5-7.0m2 @ 2.0mm thickness. Apply 2nd coat within 24 hours of first coat. 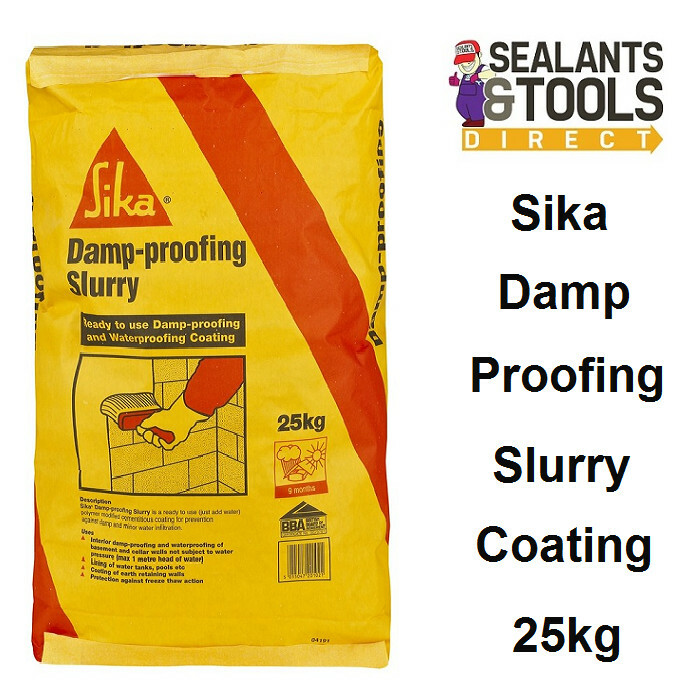 Sika Damp-proofing Slurry does not provide a trafficable finish. Protect with a levelling screed. Special attention is required to avoid puncturing the waterproof coating with fixings. These should be accommodated either by surface bonding with Sikaflex EBT. Sika Damp Proofing Slurry will not bond to surfaces that have been treated previously with a water repellent. Finishing plasters may take longer to set when applied over the Damp-proofing Slurry.